Last week we looked at playing open major 7th chords. This week we are going to cover major 7 barre chords. Why learn Major 7ths as barre chords? What are Major 7th Chords? If you aren’t sure what a major 7th chord is please visit the link below. The lesson at the link covers how to play open major 7th chords and what a major 7 chord is. A major seventh chord is a major chord (using the root, major 3rd and perfect 5th ) with a major 7th added on. This is not to be confused with a dominant 7th which is a major chord with a minor 7th added on. Like always with barre chords, the construction of the barre chord for any type of chord with the 6th string (Low E string) as the base, is the shape of the relevant E.
For example, a major barre chord on the 6th string uses the shape of the open E chord. A minor barre chord on the 6th string uses the shape of the Em chord. And so on. So for major 7th barre chords the shape of the Emaj7 is used. 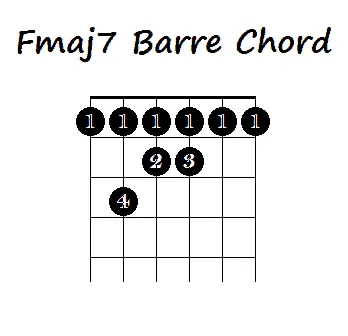 For example for an Fmaj7 barre chord the 1st fret is barred by the 1st finger and the 2nd, 3rd and 4th fingers make the shape of the open Emaj7 chord on the following frets. 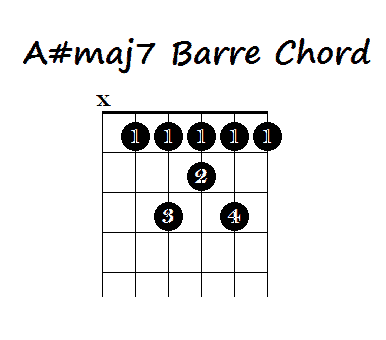 See the diagram below for the Fmaj7 barre chord. Now you can use that same shape anywhere on the fretboard to play whatever major 7th chord you would like. As with all “5th string barre chords” the barre chord is based on the respective open A chord. So, for a major barre chord the shape use by the 2nd, 3rd and 4th fingers is that of the open A chord. For our major seventh chords the shape is based on the open Amaj7. So for example the A#maj7 below the first finger barres the strings on the first fret and the 2nd, 3rd & 4th fingers make the open Amaj7 shape. And voila – you can now use this anywhere on the fretboard on the 5th string to form your major seventh barre chords. You guessed it – practice! The more you practice these chords the easier it will be to transition into them. Try learning them first until you are comfortable playing them and try transitioning from major chords. Then try transitioning from minor chords and then dominant seventh chords. The more transitions you can master the more fluid and rich your playing will become. As always if there are any questions or comments or something I have missed here please feel free to leave a comment in the comments section below. Next week we will take a look at minor 7th chords. If you’d prefer to learn by video then check out some of my online guitar lesson reviews here – or in the menu above. There are some good free lessons and even better paid ones if you can afford it.